Murals and other large pieces created by artists ranging in age from elementary students to teenagers are showcased at Youth Services' "Rites of Passage" art show at the River Garden in October. The opening reception takes place during Gallery Walk on Friday, October 5, from 5 to 7 pm, and many of the young artists will be present to talk about their work. This art exhibit, open to the public daily during October, is part of Youth Services' month-long 35th Anniversary celebration of youth. Meet the designers who worked on this "Rites of Passage" mural! At the end of August, six Windham County teenagers gathered at the River Gallery School with artist Jason Alden to create one of the signature pieces for the "Rites of Passage" exhibit. The project began with the youth artists answering a series of questions around themes of learning, being valued, and growing up, which were the basis for their initial drawings. Alden used the drawings and answers to create the large image that was cut out into random jigsaw shapes and further worked on by the teens. 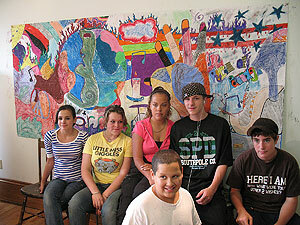 Each participant was given one or more shape to color with oil pastels. "They were encouraged to experiment with color and make each abstract design as beautiful and unique as they desired," Alden said. "When all shapes were complete, they came back together as a group and fit these pieces back together, resulting in a gorgeous and varied mural in which each unique section has its own worth but contributes to the larger, coherent mural design." "It was a wonderful experience that I got to have with a lot of kids I didn't know," said artist Ahlian Morris, age 12. "Because of [this experience], I'm now taking art classes." "It was a great teamwork project," added Robert Bessette, age 15. "Four hours before, most of us had never met, but it didn't stop us from working together and producing something really amazing," said Karen Cribari of Youth Services, who helped coordinate the project with the River Gallery School. 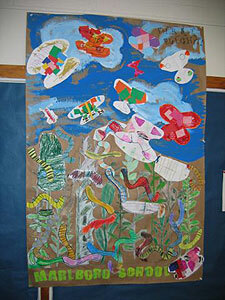 A collaged mural in the show is "First Flight" by Marlboro Elementary School students, kindergarten through 4th grade. "Our students have been observing the changes going on with caterpillars turning to butterflies, getting to use their wings and having their 'first flight'," explained art teacher Lauren Von Krusenstiern. "That is what inspired this mural, which uses colored tissue, oil pastels and charcoal. It's a nice metaphor for school and growing up -- lots of changes and being given wings to discover other wonders of the world," she said. Dummerston School's contribution of ten close-up images of seashells evoke the sensation of awakening and introspection. "Artic Wave," by 8th grader Elena Eames, is drawn in pastel on wet paper, which gives it a more painterly feel. Brattleboro Union High School, Academy School, Marlboro Elementary School, Great River Arts, Dummerston School, Twin Valley High School, and River Gallery School all contributed artwork to the "Rites of Passage" show. Youth Services' programs have been empowering local youth and families to cope with life's challenges and develop new life skills since 1972. The agency serves over 2,200 local young people and families each year through 10 programs ranging from Big Brothers Big Sisters, to Juvenile Court Diversion and Youth and Family Counseling & Therapy. For more information about 35th Anniversary events in October, or about Youth Services' programs, call (802) 257-0361 or visit online at www.YouthServicesInc.org.